The Mexico Beach Artificial Reef Association (MBARA) was formed in January of 1997 and has since deployed over 150 artificial reefs. 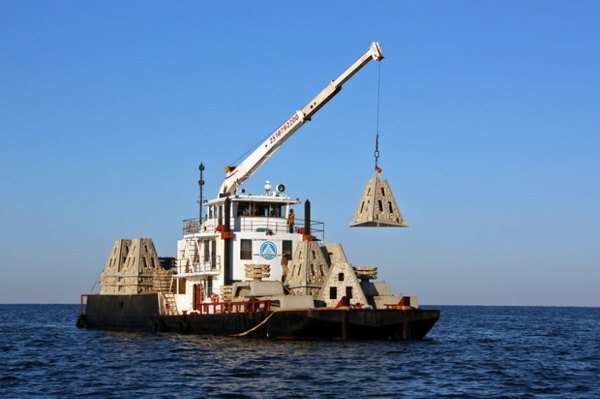 The primary function of the organization is the conservation and environmental improvement of our natural and artificial marine reef systems in the Gulf of Mexico near Mexico Beach, Florida, but that is not all that has been done by the organization. Since its inception, the MBARA has also worked very hard to conduct and promote scientific research and evaluation of reef designs, biomass development, and fish productions. The third function of the MBARA is educating the public about the importance of reef systems to the marine ecosystem, and the impact they have on the coastal communities where they are built. All parties benefit when the information on reefs is disseminated to the public. School children, the organization's members, and the general public need to know all about reefs and reef building in order to help promote conservation and environmental improvement of the marine reef systems. Please join today! Your membership dues and tax deductible donations will be used to build new artificial reefs. For your convenience you can JOIN ONLINE. Are you an experienced diver? Do you have computer and writing skills? We also need writers to process grant applications. We Need Volunteers! If you don't have time to volunteer, you can still help by making tax deductible contributions for reef building. 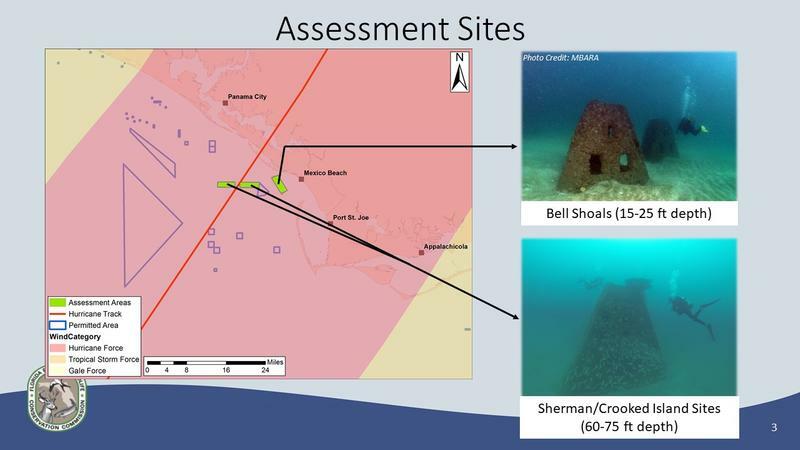 During the month of December, FWC conducted the first phase of side-scan sonar surveys off Mexico Beach to assess impacts to artificial reefs. Afterwards, they conducted several random exploratory dives to get visual confirmation on sonar recordings. To view the preliminary results of this ongoing project, visit Initial Hurricane Michael Impact Report for details and preliminary findings guiding further assements in the near future to better understand what happend. This data will be used to help MBARA plan future reef construction locations and structure designs to better withstand effects of strong storms. 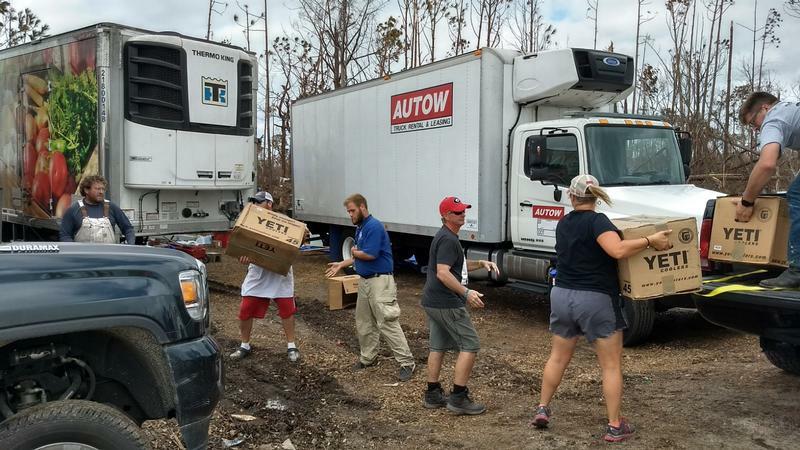 The MBARA partnered with YETI in distribution of 64 ice chests to storm victims in the heavily devastated City of Mexico Beach and surrounding areas. We also loaned our large smoker/grill to Camp Happy Tummies, orchestrated and ran by Michael Scoggins of Killer Seafood. Camp Happy Tummies began feeding residents, first responders, and volunteers in Mexico Beach when no other food services were available. Due to a continuing need, they have kept up this tremendous volunteer effort. Shortly after the hurricane, MBARA began posting hurricane updates on their Facebook page, passing on vital information. One of the most popular posts was an album of 150+ aerial photos taken the day after the storm by David Walter of Walter Marine (prominent reef builder for Mexico Beach). For many, these photos were the first look at the devastation, settling some of the anxious uncertainty of home and business owners in our area. Now, the MBARA has added a new mission to raise funds for disaster aid. At a request from the City of Mexico Beach, the MBARA Board amended the Bylaws to assist with recovery after disasters. The City has been approached by donors, but they did not have a venue to receive donations. MBARA needs to help our area recover in order to continue with our missions to build artificial reefs, and provide reef education and research. As a 501(c)(3) nonprofit charity organization, we will begin taking donations to be used by the City of Mexico Beach for recovery projects such as dune walkovers, Parks and Recreation (parks, restrooms, etc), Mexico Beach Fire Department, Pier, streets, Fish Cleaning Station/Cooler, landscaping, canal pavilion/canal, and arts & culture programs. The City can apply for grants from organizations such as FEMA and the State, but have to provide matching funds in addition to the grants. 100% of the contributions received by MBARA will be disbursed as grants to the City. You can be assured the donations will be disbursed as desired. MBARA is a transparent organization and we post our tax documents (IRS Form 990) on our website and on Guidestar for anyone to view. Donors can mail checks to MBARA, P.O. Box 13006, Mexico Beach, FL 32410. You may also donate online at www.MBARA.org by clicking on the yellow “Donate” button. Be sure to add a memo to your donation telling us how you want your contribution to be used. If unspecified, the money will be used at City leadership discretion. Remember, MBARA is nonprofit and your contributions may be eligible for a tax deduction. This memorial reef is in honor of William Thompson Reiners III and placed on 20 Apr 2018. 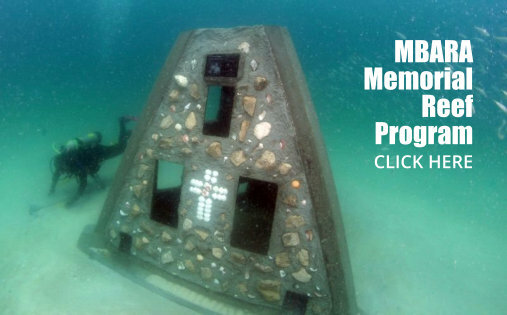 The memorial is a 10-foot Florida Limestone Artificial Reef with plaques. 4 Chicken Transport Units welded together in pairs placed on 20 Apr 2018. This memorial is in honor Robert "Buddy" Jacobs placed on 20 Apr 2018. It consist of a Florida Limestone Artificial Reef with a plaque and measuring 10 feet tall and 10 feet wide.